Photo by At Maculangan. Click for more. was curated to serve as an announcement that the Philippines’ first village museum, created by its residents, begins its institutional life. The Lamlifew Village Museum is located in a hilly sitio of the town of Malungon, Province of Sarangani. At the moment, it is an empty thatch and bamboo structure larger than the huts of the residents, a closely-related Blaan-speaking community. 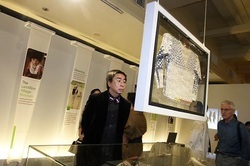 The first materials developed for the interior of the museum are the photographs and initial texts exhibited during tonight’s launch. These materials will be shipped to Lamlifew after a few days at the National Museum. At Lamlifew, the photographs will be serving two bridging functions. Firstly, between the residents and visitors, these images will represent portals into Blaan life (traditional, transitional, and altered), particularly in relation to geographic and social areas that visitors will not be able to access readily. Secondly, between and among the Blaan residents themselves in Lamlifew, especially across the generations, the photographs will be the foci of discussions, narrations, perhaps singing—with the intended outcome of compiling data, from within the community, at their own pace, usually without the presence of visitors, out of which they can craft which stories they wish to tell about themselves. With this system, the tasks of data-gathering, interpretation, editing,and conveying information, will primarily be in the hands of the residents of Lamlifew. It is expected that they, in turn, will also develop a strong sense of trusteeship over the narratives of other Blaan in the more interior areas of Sarangani, on one hand, and on the other hand, a dynamic relation with parties coming from outside their cultural world. 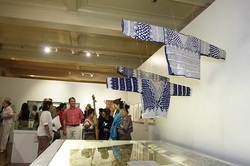 Thus, a major part of the work of the Lamlifew Village Museum is to attempt to gain access to photographic images of old Blaan artwork (dyeing and beadwork in particular), to try to relearn the processes and aesthetic-spiritual content that create these materials, and to try to harmonize this re-learning process with the demands of a changing world. 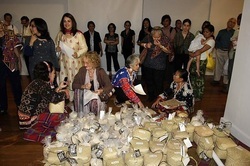 Tribal Women’s Association chose to focus on the still-intact rice planting traditions as the museum theme. During the coming years of re-learning material culture skills — and they know this will take a long time — they have decided to promote upland rice agriculture. ways that allow them the dignity of a continuing link with their own sources of genius. *Information courtesy of Ms. Marlene Po, co-organizer of the event. Photos by At Maculangan.